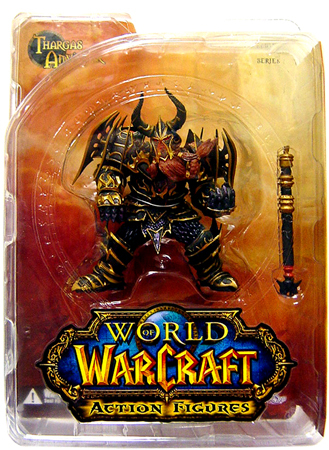 WOW DC Unlimited Series 1 Dwarf Warrior- Thargas Anvilmar is a hearty collectible, just like Thargas! There is no packaging condition guarantees on this item due to the manner in which the manufactuer packed them! The stoic dwarves of Ironforge are an ancient race of robust humanoids who live beneath the snow-capped mountains of Khaz Modan, where they revel in the prospects of battle and storytelling alike. In past ages, the Dwarves rarely left the safety of their mountain fortresses. However, whenever the call to battle sounded, they rose up to defend their friends in the Alliance with unmatched courage and valor. Due to a recent discovery, they feel that their destiny is now to search the world over for more signs and proof of their enchanted heritage and to rediscover the Titans hidden legacies. 5 inches high. Each figure features multiple points of articulation. Includes an alternate head so that you can choose whether or not you want to show your helm.